To loop, or not to loop ? This Sunday (March 2), a field of over 100 ultrarunners are expected to turn out for the USA Track and Field 50k National Championship at Caumsett State Historic Park. 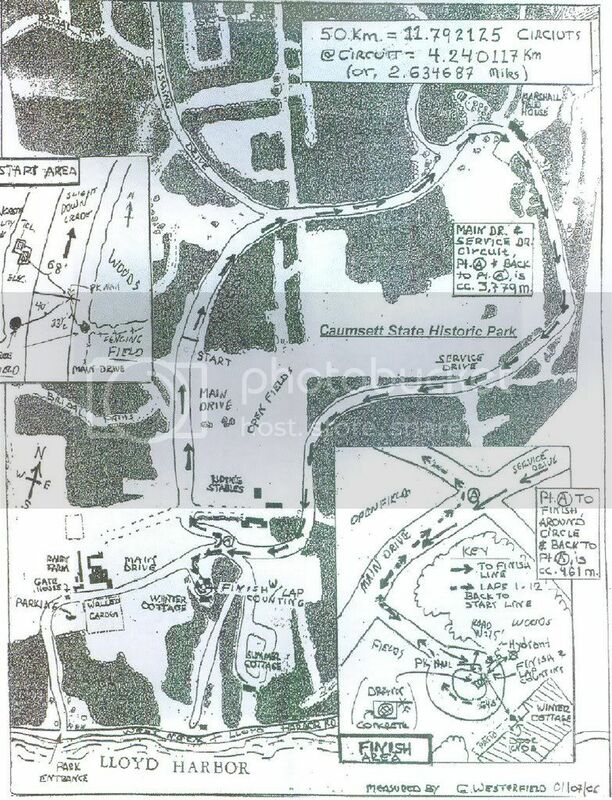 This will mark the third consecutive year that Caumsett State Historic Park is hosting the USAT&F 50k National Championship (as well as my 3rd straight year running this event). Michael Wardian, the 2007 JFK 50 Mile winner, Jason Saitta, the 2006 Caumsett champion, and other top national and local ultrarunners are expected to participate. The women's field is still a bit of a mystery (Ann Lundblad won in 2006, Anna Fyodorova won in 2007). Caumsett State Historic Park is situated on a scenic peninsula extending into Long Island Sound and offers miles of walking, jogging, hiking, biking, cross-country skiing and nature trails over acres of woodland, meadows, rock shoreline and salt marsh. In 1921 Marshall Field III purchased 1750 acres of Lloyd Neck to create one large estate. He named the land after its Matinecock Indian name, Caumsett, which means "place by a sharp rock." Field created a self-sufficient English-style estate as a combination country club, hunting preserve, and home, complete with its own water and electrical supply. When the estate was finished, it had facilities for every sport except golf. The park, acquired by New York State in 1961, offers diverse activities such as fishing, hiking, bird watching, nature photography, and nature study. The polo pony barn provides lessons, boarding & equestrian services as part of the Willow Tree Farm Equestrian Center. The summer cottage houses the Nassau BOCES Outdoor and Environmental Education Program. The Volunteers for Wildlife Hospital and Education Center is located in the "Calf Barn" of the park's Dairy Complex which provides rehabilitation and hospitalization for Long Island's injured wildlife. The historic Henry Lloyd Manor house built in 1711 is leased to the Lloyd Harbor Historical Society which provides historic interpretation of life during the colonial period. A little on the race itself...... As I mentioned, this will be my 3rd straight visit to the Caumsett Park 50k, having run a dismal 5:45:55 in 2006 and a 4:58:01 (my 50k PR) in 2007. The race is the first race in the New York Ultrarunning Grand Prix Series and is run on a 2.635 mile loop (11.792125 laps of it). The course is entirely on a paved path. There are two aid stations per loop, one offering water and food, the other with fluids only. 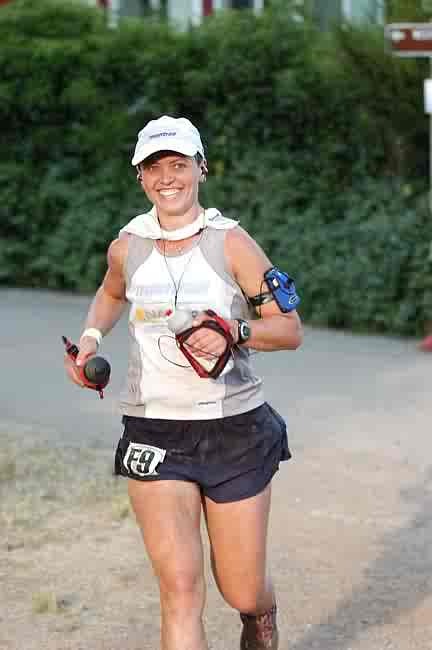 If you want to take a look at the Motion Based GPS data for this event, click here : 2007 Caumsett Park 50k GPS Data. The course is relatively flat, with only one hill of note (as you approach the Field House). There is also usually a stiff head-wind on the back-side of each loop for runners to deal with. The course does offer a lot of convenience for runners as far as gear goes. The 2.635 mile loop makes it very easy for runners to stash their gear, gels, etc... at the start/finish area. The race is well supported. In fact, the aid station located mid-loop is always staffed by an enthusiastic and encouraging group. Shoe Gauge : The course is entirely paved path. Road shoes are highly recommended. Weather Gauge : Typically temperatures this time of year call for highs in the low to mid 30s. In addition, the strong head-wind that runners face on the back-end of each loop easily drop the real feel a good 10-15 degrees. Gear Gauge: Under normal circumstances (for the normal runner), this is a "long" race - long pants, long sleeve shirt, long everything. However, early forecasts are calling for Sunday to be mostly sunny with a high of 45 degrees (kind of middle-of-the road temperatures). Sanity Gauge : Ok, 11.792125 laps on pavement can drive anyone crazy. Didn't someone say "and that's all I have to say about that" ?? Better you than me, my friend. ;-) I'm off to Old Pueblo and its 50 miles of trail through the beautiful desert of Southern Arizona! What does it say about me that I'm actually looking forward to this? :))))) Aren't we all a bit crazy ? And Trail Goat, didn't you just run up and down a #%#$@#$ mountain last weekend...think you can take a break ? Last weekend wasn't a big deal... it was only one mountain after all! 5:45:55 would be a great time for me :( you're too fast for me. booooo. thanks for the preview! I am looking forward to having a blast this weekend!!! How about chasing my time there, huh? It wasn't too bad looping, but then again, I didn't know any better...and I used it as a training run with a 6-10 day Master Rimas himself. Lotsa talking stories, man, international stuff. Say hi to Nick Pallazzo for me! He is Da Man! Olga - what time do I have to beat ? There's probably no way I can keep up with you ! Nick is great. I'll say hello. Wish MY race was coming up in 2 days! I'm jealous! Tear'em up! !